Beale Street is a feast for the eyes. Neon pinks and blues mark entryways to noisy watering holes. House bands led by smoky-voiced singers serenade bar rooms filled with mostly out-of-towners. The names of legendary blues musicians like B.B. King are scrawled across building facades, forming a prominent part of the iconography of Memphis proper. The main drag of bars and restaurants along historic Beale are situated right around the corner from the FedExForum, where the University of Cincinnati hoped to defend its conference title. Gary Clark, Jacob Evans III, and Kyle Washington notably absent for this year’s conference run, few believed the Bearcats stood much of a chance of repeating. This being my first trip to Memphis, I found the City surprisingly small. For a Mississippi River city of such historical significance, it’s more deep than dazzling, more personal than impressive. Like the host city, basketball is a personal game. Even with large crowds in the arena, the spectator experience is intimate. Whenever there’s a small crowd viewing a game, it feels awkwardly intimate to watch, like you’re intruding upon another family’s dinner. Fans (and their shouted opinions) get grafted into the action on the court. With conference foes converging on the FedExForum from afar, the crowds were small in Memphis except when the Tigers played. I love how basketball feels. In a close basketball game, you can literally feel the temperature of a gym rise when a team gets hot. Amazingly, this is the case at nearly every level of the sport. I’ve sat in bleachers for middle school games where momentum swings and spectators lose their minds, swept away by the energy and passion of their tribal moment. There’s a rhythmic symmetry to basketball, as well. Cheerleader chants and pep bands are out front, leading the assembly. Sneakers squeak as loud as electric guitars on Beale Street. Balls bounce to the timbre of the kick drum; rims clang like a snare. At one point during the SMU game, UC big man Nysier Brooks lost his footing and landed awkwardly on the hardwood. In that small crowd, Mick Cronin audibly expressed his frustration, which cut through the arena, “Come on, Nas! Come on? !” Brooks looked at Cronin, who shrugged in a pleading fashion. His coach wasn’t mad; he was disappointed. And we all knew about it. Cronin’s disappointment dissipated as the Bearcats ultimately overwhelmed SMU in the second round (82-74). Adding to Jarron Cumberland’s 26 points and 8 assists, both Tre Scott and Justin Jenifer scored 17 points. In the third round, “Nas” Brooks led UC to a win against Wichita State (66-63), scoring 13 points and grabbing 9 rebounds. Traveling down to Memphis, there was little mystery about what it would take to win the tournament. Most knew that to defend 2018’s conference title, the Bearcats would have to defeat a two-loss Houston Cougars team that swept the regular season series, their last victory in Clifton spoiling UC’s home winning streak. Headed into the final pairing on championship Sunday, the stage was set for yet another Bearcats/Cougars battle. Familiar as old sparring partners, Houston and Cincinnati know each other inside and out. Despite that, Houston still seated a couple of scouts near me during the Wichita State game. After UC’s third round win over the Shockers, Houston’s scouts aired some personal jabs about Jarron Cumberland’s level of effort to each other. I overheard their conversation and somewhat reluctantly shared their comments (you know, in the name of #journalism). In Sunday’s tournament final, Jarron responded. Cumberland flat dominated the Cougars. Scoring 33 points and grabbing 8 rebounds, he led the Bearcats to a repeat American Athletic Conference title, the University’s first back-to-back conference championship since the mid-90s. UC also smothered Houston’s customarily-prolific offense. Corey Davis, Jr., the Coogs’ all-world senior leader, was limited to only 12 points. Beyond the pre-game criticisms of Jarron, UC’s redemption over Houston felt personal, largely because this year’s team is such a tight knit group. It’s evident UC’s players have grown progressively closer as the season has stretched on. Maybe that increased unity is attributable to the low expectations most had for them coming into the season. Maybe it’s attributable to the many close games they managed to eke out. Or maybe it’s a combination of those factors, or something else. Regardless of the catalyst, UC will need to be personally cohesive as they face Iowa in the first round of the NCAA Tournament. Personally, I think the City of Memphis grows on you. As Gus’s fried chicken and Central Barbecue settle onto your ribs, the river city’s charm embraces. Upon exiting the FedExForum, sounds from different house bands and bars along Beale Street fight for your attention. After UC bested SMU Friday night, Andy and I made our way toward the noise and some usual suspects. For what felt like my tenth meal of the day, I met up with Chad Brendel (Bearcat Journal) and his pops, Justin Williams (The Athletic), and Michael Shults (a UC/CCM alum who landed in Memphis, teaching music at the University). At The Green Beetle, I devoured a catfish po boy and an enormous slice of strawberry cake. My goodness, the cake was a revelation. Making our way farther away from Beale, up Main Street past the Lorraine Motel, Shults guided us to Earnestine & Hazel’s. Built in the late 1800s, E&H is a quirky dive bar that may or may not be haunted. It’s rumored that at least 13 people have died in the bar, though that number still seems low to me. There’s a small, secluded bar on the second floor overlooking Main Street. Nate tends bar upstairs and he has a “Ray Charles used to hang right there” story he’s always eager to share with patrons. In the neon glow of E&H’s lights, I found myself surrounded by acquaintances who’ve become close personal friends, almost family. Several domestic beers and even more stories later, the night broke up. Headed separate directions for the night, we’d all be reunited the next day to cover a team that has matured into a cohesive unit, a team in which we all feel personally invested. 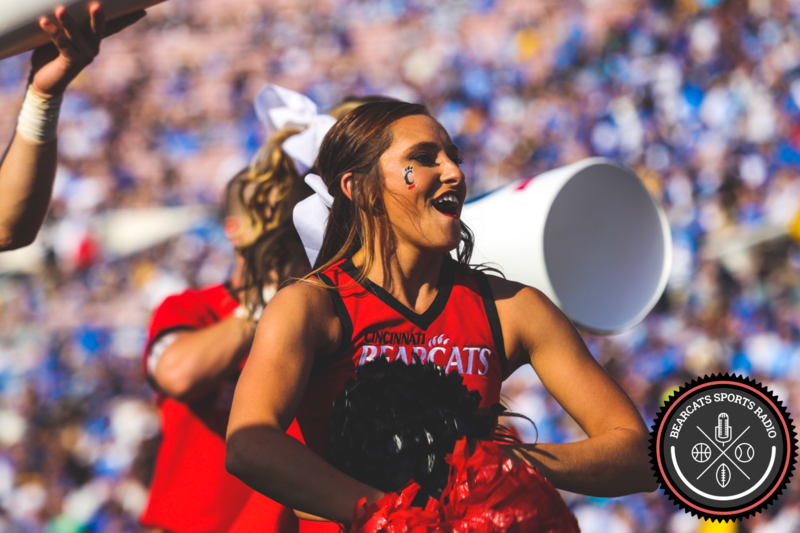 For more real-time coverage of the Bearcats, food takes, and dad jokes, follow along on Twitter – @BearcatsRadio.